I do not remember how many Samsung handsets I own, however without any doubt the Galaxy S5 LTE is the one I love the most and longest. I bought this phone when it was released, and I bought four backup batteries. I take those batteries and the charger when I travel and I am never afraid of my battery going dead. I just love cell phones with user-replaceable batteries. Well to be honest I do not love everything on my S5 prime, this is very very true when it comes to Samsung’s own touchwise overlayer and lots of bloatware. Take S finder and quick connect for example, I try my hardest to remove them from my mobile device whenever I upgrade to the latest. If you do not like them either, just read on. To disable or remove those two apps is one thing and that’s quite easy, to hide the two buttons from the notification bar is another which is much harder. If you have other Galaxy phones, this should work too. S5 came with Android 4.4.2 in 2014. At that time, you could choose Dalvik or ART although S5 LTE did not have a choice. I suppose here you are still with Dalvik (my wife’s handset is still running 4.4.2 Dalvik) and that’s where I begin. 2. Install Xposed, then download, install and enable the module G-Touchwiz. 3. 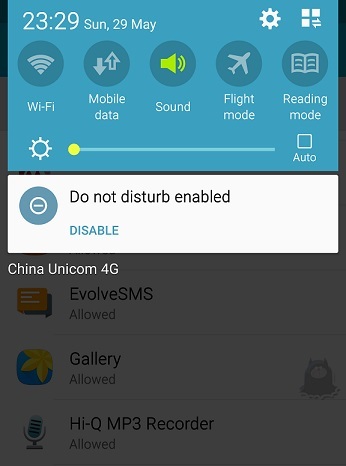 Open G-Touchwiz and disable quick connect, and S finder. Now reboot and check. What happens? Yes, they are gone. If you do not have Xposed installed. Try Tasker profile. Take S finder for example, set up below parameters. I think some people are still using Lollipop, right? Well if you stay with Android 5.0.1 or 5.1 for whatever reason, try this. 1. Root your mobile phone. 2. Download this app to your handset. 3. Open up Root Explorer and go to /vendor/overlay, create it if it does not exist yet, do not forget to set the permissions. 4. Copy the file to the folder you just create and set the correct permission. 5. Reboot and see for your self. If this unfortunately does not work for you, download this file, extract and install it (copy the folder to /data/app and remember the permissions if you fail to install it), of course you need to reboot. Android 6 is now the most up-to-date system in the Android world and many models of Galaxy S5 are starting the receive the update. If you have the new system and want to get rid of these two buttons, here is the tip. 2. Open Root Explorer and navigate to /system/etc/permissions. 3. Backup com.sec.feature.findo.xml and then delete it. 4. Reboot and check for yourself. Very easy, right? Just give it a shot! Now comes the final solution. Find a ROM that does not have those apps and buttons lol. If you do not like the ROM for whatever reason, extract the systemui.apk and replace yours if you have the same OS version, remember to backup. Sometimes others may share their systemui.apk and that’s a good option too. However this could lead to a disaster if that app does not work and collapses all time, which means you will not have the time to restore your backup. A better solution would be create a .zip file (not the common zip file, you know what I mean) and flash it with a third-party recovery like TWRP, for instance. Actually for some Samsung Android devices (Galaxy A8), simply scroll down your notification area, tap edit and then uncheck the s finder and quick connect at the bottom will do the trick. Go check your phone to see if it works now. There are of course other solutions out there too, share with me if you have one.